Back in June, I made a pretty flowy summer dress for my friend Laura. I loved it so much that I really wanted to make something similar for myself. The problem was, we were in the middle of packing everything up to move out of Vancouver. Time was short and household items were rapidly disappearing into the moving container as the month wore on, but somehow I managed to squeeze out a few extra hours and delay the packing of my sewing machine and one beautiful piece of fabric I had recently found. This circle skirt + bodice ensemble was the result. I always love pretty florals in blues, and this Michael Miller’s “Lily-Of-The-Valley” print is just to my liking! I purchased this fabric back in May to celebrate La Fête du Muguet (Lily of the Valley Day, May 1), which, in France, is a day on which one traditionally gives May lilies to their social circle. My version involved May lilies printed on fabric, and though perhaps less radiant that real lilies, these ones should certainly last longer! The ensemble itself is self-drafted and composed of a midi circle skirt and princess seam sleeveless bodice with side zipper. 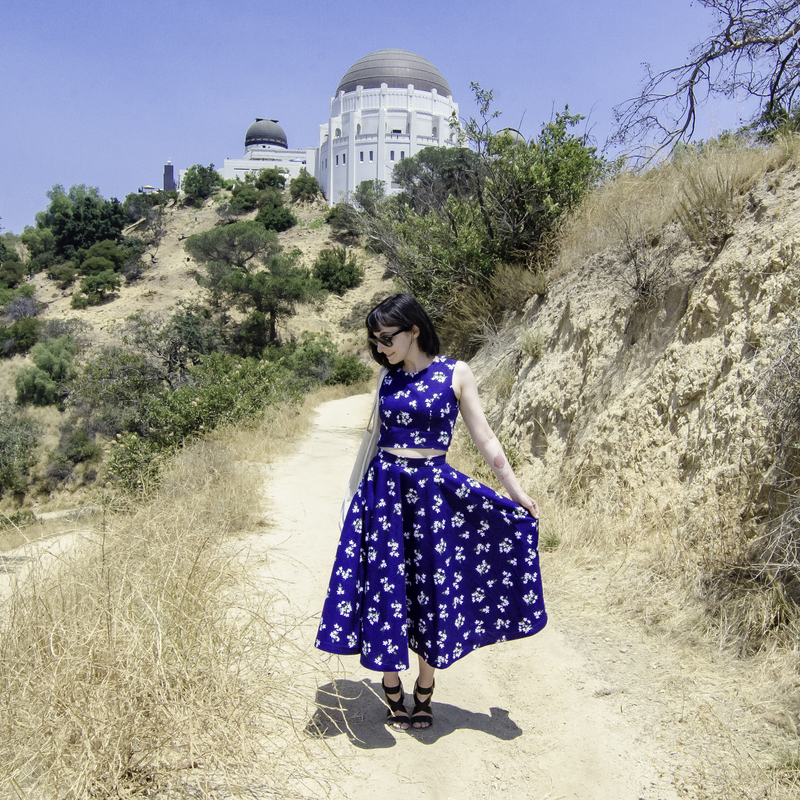 Here are some pictures, shot at the Griffith Observatory in LA, a beautiful place made famous in Rebel Without A Cause.